For reasons not worth going into here, last week, I ate Lebanese food three nights in a row. Yalla Yalla on Thursday. Hiba on both Friday and Saturday. Both places enjoy positive TimeOut reviews, with Yalla Yalla enjoying some extra buzz after the recent opening of its Oxford Circus branch. Still, I left Yalla Yalla thinking it was a nice option to have when shopping on Oxford Street, but otherwise, I wasn’t super impressed. The service was a bit pushy (my friend and I ordered seven mezze to share and the server still asked us “are you *just* having mezze? no main courses?”), and the food, while attractively presented, ranged from not-good (e.g., squeaky, over-salty halloumi) to good-but-not-memorable (e.g., fattoush). 24 hours later, I’m at Hiba Restaurant, an oasis on an otherwise forlorn stretch of Borough High Street. Where Yalla Yalla was spare and Wagamama-cafeteria-dining like, Hiba aims for chic, nighttime atmosphere. It’s warm and inviting, and I was glad we’d made a booking, because the restaurant was packed on both Friday and Saturday nights. Minor hiccup when a server told us we’d have to wait a few minutes for a table “because you were 14 minutes late for your booking.” I swear we were less than 5 minutes late for our booking, but in any case, I could have done with less accusation, generally. 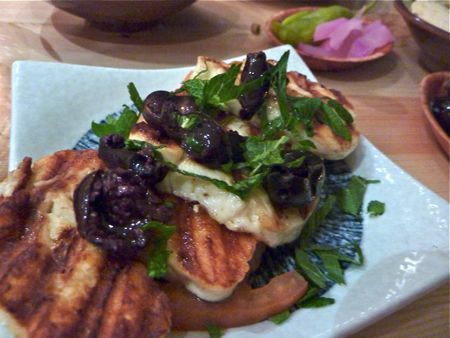 Star attraction at Hiba: Halloumi. There were many tasty, memorable dishes at Hiba (e.g., crispy, fragrant falafel, refreshing grilled aubergine with tomato, onion, parsley and mint (bazenjan al-rahib)), but for me, the halloumi stole the show. I ordered it both nights I was at Hiba, and it was superb on both nights. Yielding, almost-juicy tofu-like texture. No squeakiness. Mild, creamy almost-mozzarella flavor with a hit of smokiness from the grill. Contrast with Yalla Yalla’s version, which looked pretty. But the halloumi was a bit squeaky and grilled to dryness. Worse still, the halloumi’s saltiness was further compounded by the salty olive topping. My friend and I, lovers of halloumi, couldn’t finish it. Order anything at Hiba that comes with labneh, a thick cheesy-tangy yoghurt. 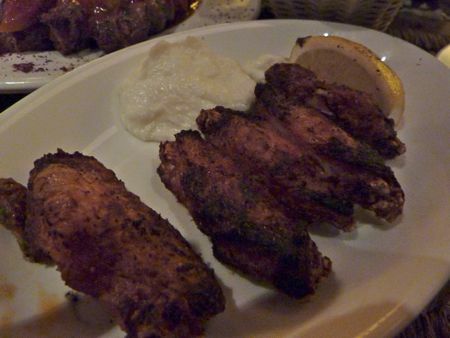 The chicken wings at Hiba, for example, were a bit scrawny, but they were saved by the garlicky labneh served on the side. Hiba’s kibbeh, which was better/more moist than Yalla Yalla’s version, still benefited from the rich labneh we’d ordered. Labneh can transform any dish for the better, it seems. I will say that Yalla Yalla does a better job of plating than Hiba does. 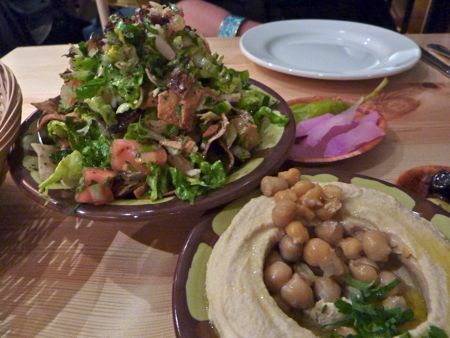 Everything at Yalla Yalla was visually prettier, especially the fattoush. Salads usually taste better when they look pretty, I think. But it takes more than good looks to win me over. Take, for example, Yalla Yalla’s sfihe, whose menu description sounded perfect. But in reality, the “pastry” was really just a stodgy, thick bread filled with very little lamb/onion mince. The pomegranate molasses had such a strong flavor that more savoury mince filling was desperately needed to balance things out. 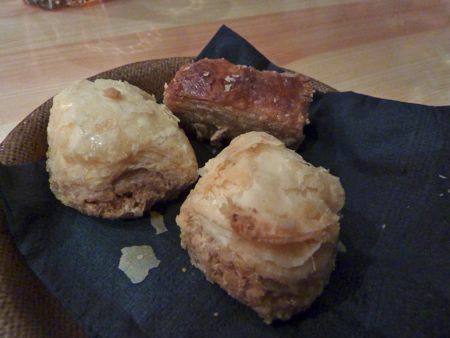 Hiba's baklava - lovely to look at and lovely to eat. And free! Ending was no competition. 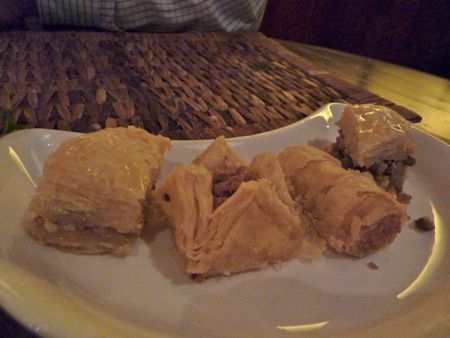 Pale, stolid-looking baklava at Yalla Yalla for about £5 versus delicious, flaky baklava for free at Hiba. Advantage Hiba, obviously. 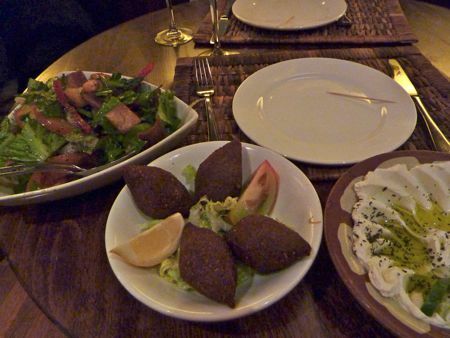 Prices at both restaurants were similar, with most mezze costing less than £5 and most mains at £12. None of my three meals cost more than £25, including service and wine. 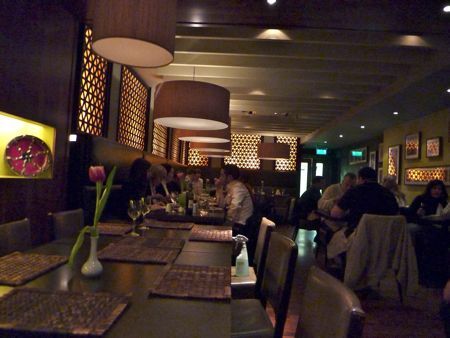 If you’re looking for a relaxing, tasty night out with friends or a date, Hiba fits the bill perfectly. Oooh Hiba sounds great – close to me too. I haven’t been overly impressed by Yalla Yalla either; their chilli sauce had absolutely no kick whatsoever. I totally agree about Yalla Yalla, nice enough, but nothing too special, with only a few memorable dishes (some for the wrong reasons). Hiba looks great, and will indulge my love for halloumi there soon. I like the original Yalla Yalla (although I am obsessed with Lebanese food) so it sounds like Hiba is where I should head next! Handy to my work as well. Good on you for unearthing Hiba – it’s always good to have some alternatives to the ‘blogsensus’. I’ve been past Hiba about a thousand times on the bus and every time, without fail, I wonder what it’s like… Love Lebanese food and so will visit soon. You make it sound really good. Thanks for that! Hiba sounds like my kind of place! Sad I’m not there to experience it, but hey…am leaving for Israel/Dubai/Bahrain on Tuesday so I think I might have some mezze to look forward to! Went to new YALLA YALLA off Oxford Street, and it was as good as usual in their SOHO branch! For these who knows what halloumi cheese, just to remind you it is a salty cheese in general! being a BIG fan of Yalla Yalla, will go back soon. Hiba…..??! !but that does not sound Lebanese, even the food dont look Lebanese….. 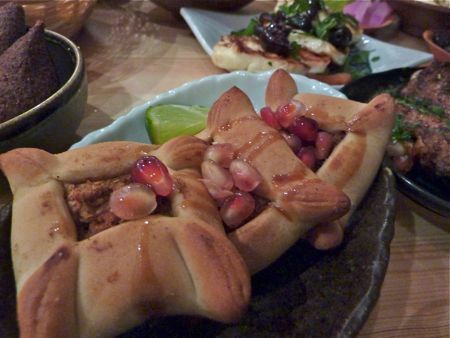 I ve been at YALLA YALLA both Soho and oxford street and it was great, food , service and atmosphere, great vibes. What bout the rest of Dishes you tasted at Yalla Yalla and Hiba? ?as you just criticised 3 dishes. Regarding the food i think also you did not judge YALLA YALLA fair enough and at the end that is you opinion and your palate…..! By the way Backlawa at Yalla yalla cost £3.00 not £5.00 as you said. I’m sold. I walk past Hiba every day and have wondered what it was like- now I know! Think I have a date with halloumi very very soon… Thank you! 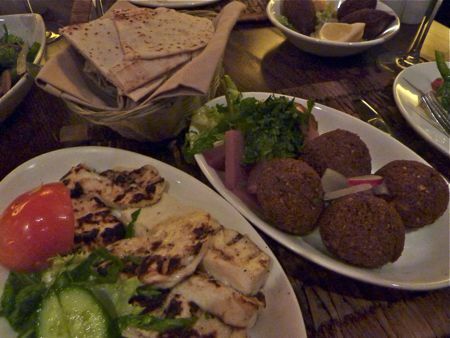 I love middle eastern food…. have a real thing for chickpeas at the moment. they look delicious. did you steal any recipes from the chef?! @Kay, Lizzie, Tehbus, Gourmet Chick, Mr. Noodles, Bron and Tori – Yes, def try the mezze at Hiba and let me know what you think. The halloumi is def a winner there. @Matthew – Glad to hear you’re a big Yalla Yalla fan, but I think you’ll like Hiba better, so try it out sometime. And yes, I know halloumi is a salty cheese, which is why pairing it with another, saltier item (olives) was not a good plan. @Amy – Your comment is all over the place, but thanks for sharing. @Jane – good question, but there’s only so much squeakiness I can handle before I get squeamish. @Ellie – I promise it wasn’t burned. Not sure what looks “dirty,” but maybe you’re referring to the char from the grill? @cooking fairy – Despite eating at Hiba two nights in a row, no I didn’t get any recipes off the chef. You know, it’s never occurred to me to ask, but I like the idea.